Water is one of the necessities for life, this is why water shortage is becoming a serious issue all around the globe. In these conditions, any method to harness water is to be appreciated. But if the harnessing takes place without the need of expensive infrastructure, only then it is the real lifesaver. Warka Tower is going to be that lifesaver. According to Italy’s Architecture and Vision, this off-grid bamboo tower will be able to harness an annual average of 100 liters (26.4 US gallons) of water per day. The height of a completed Waka Water Tower is 10 m (33 ft) and it weighs 60 kg (132 lb). It is secured to the ground using eight guide ropes. 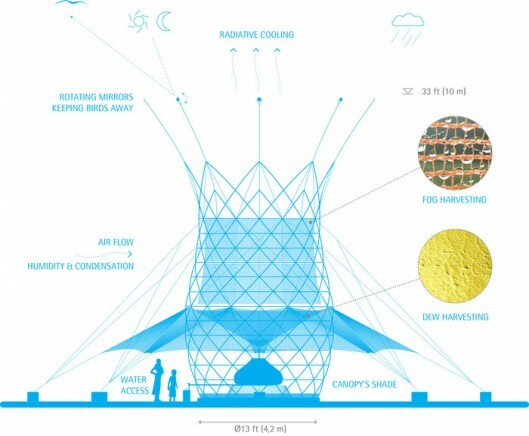 There’s a lightweight woven bamboo structure in the tower and a plastic mesh on the inside, which retains the water droplets from the fog, and the droplets trickle down to the collector and to the large tank where they are stored. Rain and overnight dew is also collected by the tower. The tower will have a canopy for people drawing water from the tank so they would stand in shade, and a series of rotating mirrors that will keep birds away from the tower. The tower operates without electricity Moreover, its construction does not need any cranes or heavy machinery. According to the company, it takes six people four days to construct the tower; assembling the tower on-site takes four people three hours. 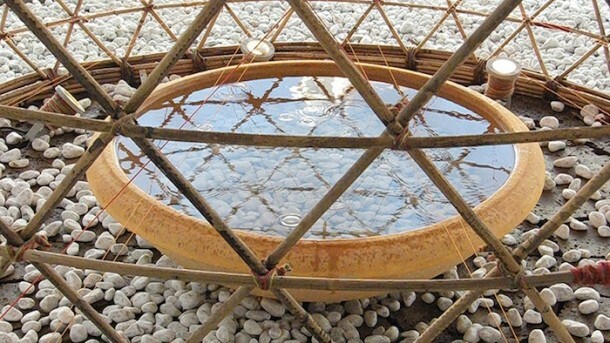 The success of Warka Towers also depends upon some other factors, like the quantity and quality of the drawn water, and the durability and reliability of the tower and its cost as well. Though $1000 might seem like a very small price to pay when compared with other water infrastructure, still it is a huge amount for the developing countries to spend. The tower is said to last for about 10 years, but the requirement is that locals are trained and they keep check on the maintenance of the tower. The testing is still to be done, to check if the tower could harness as much water as the company estimated. This is a very small working prototype produced by Architecture and Vision and they are waiting for their necessary funds to be collected through a Kickstarter campaign, so that they may do a full-scale field test. The tower will not be suitable for all areas. The raised funds will help them develop a working model and the rewards promised by the company include Warka Water-related apparel and a scale model. If the system proves to be useful, Warka Water will seek further donations to install more units in selected locations in Ethopia, before it is introduced worldwide.